The International Conference on Mechanical Design and Production has over the years established itself as an excellent forum for the exchange of ideas in these established fields. The first of these conferences was held in 1979. The seventh, and most recent, conference in the series was held in Cairo during February 15-17, 2000.
International engineers and scientists gathered to exchange experiences and highlight the state-of-the-art research in the fields of mechanical design and production. In addition a heavy emphasis was placed on the issue of technology transfer. Over 100 papers were accepted for presentation at the conference. 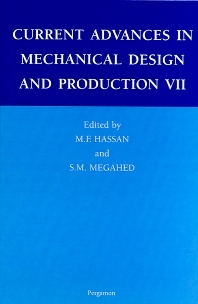 Current Advances in Mechanical Design & Production VII does not, however, attempt to publish the complete work presented but instead offers a sample that represents the quality and breadth of both the work and the conference. Ten invited papers and 54 ordinary papers have been selected for inclusion in these proceedings. They cover a range of basic and applied topics that can be classified into six main categories: System Dynamics, Solid Mechanics, Material Science, Manufacturing Processes, Design and Tribology, and Industrial Engineering and its Applications. Section headings and selected papers: System Dynamics. Autonomous control of complex systems: robotic applications (Keynote paper) (M. Jamshidi). Fuzzy guidance control for a mobile robot (W. Gharieb, G. Nagib). Dynamic ride properties of a roll-connected vehicle suspension (S. Rakheja et al.). Bilinear control theory of smart damping systems (E. El-Beheiry). A neural adaptive approach for relative guidance of aircraft (M. Shahzad et al.). Solid Mechanics. The modeling of inelastic compressibility and incompressibility using the viscoplasticity theory based on overstress (VBO) (Keynote paper) (E. Krempl, K. Ho). Shakedown analysis of an infinite plate with a central hole under biaxial tension (M.S. Attia et al.). Fracture modeling of a cruciform welded joint during weld cooling (W.M. Behnam et al.). Mechanics of fracture in fibrous metal matrix composites (Y.A. Bahei-El-Din, A.M. Elrafei). Properties of cementitious composites containing non-recyclable glass as a fine aggregate (I.H. Shehata et al.). Material Science. Poisoning of grain refinement of some aluminium alloys (A.A. Abdel-Hamid, A.I.O. Zaid). Creep behavior of solid solution alloys: role of dynamic-strain aging (M.S. Soliman, S.A. Almakhdoub). Structure and engineering properties of some ductile irons (A. Refaey et al.). Effect of alumina additions on the mechanical behavior of PM MMC with low strength matrix (A.A. Mazen, A.Y. Ahmed). Bonding and properties of explosively compacted copper powder and polypropylene granules (A.A. Hegazy). Manufacturing Processes. New trends in CIM: virtual manufacturing systems for next generation manufacturing (Keynote paper) (B.K. Choi, B.H. Kim). On the prediction of surface roughness in turning using artificial neural networks (I. El-Sonbaty, A.A. Megahed). Development of spot-weld bonded low carbon steel damping sheets (S.M.H. Darwish, A. Ghanya). Design and Tribology. Design for manufacture and assembly (DFMA): concepts, benefits and applications (Keynote paper) (A.M.E. Bayoumi). Assessment of reliability parameters for maintenance based units using Linearized Weibull Model (A.A-F. Mostafa, A.A. Khattab). Industrial Engineering. Feature recognition algorithm for process selection (A.D. McCormack, R.N. Ibrahim). An investigation of the group scheduling heuristics in a flow-line cell (A.S. Hozayyin et al.). A fuzzy reactive approach for the crew rostering problem (W. El Moudani et al.). Author index. Subject index. List of participants.